In retrospect, some typewriter designs are admired mostly because their inventors managed to invest tremendous energy and ingenuity in something that was bound to fail. The Gardner is a good example. It is one of the most impossible writing machines of all times. John Gardner wanted to build a compact, cheap machine with a full array of characters and a keyboard, but as few keys as he could manage. 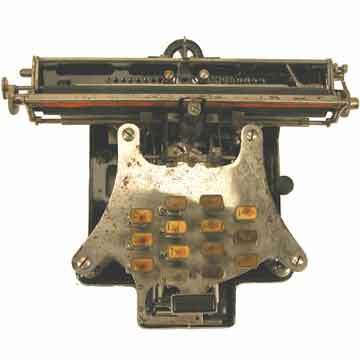 The result was an ingenious device with only 14 keys that managed to produce a total of 78 characters, depending on which combination of keys was chosen. Each key consisted of a red and a black section, each holding one letter and one figure or character. A plain strike would produce the black character in lower case. For upper case, the character and the three red options, different settings and shift keys had to be combined. Amazingly enough, Gardner not only managed to produce this machine in Britain, he also found a partner to take up production in Germany, where the machine was sold as the Victoria. And in France the same machine was produced as the Victorieuse. But of course the verdict of the market was deadly. Very few people bought one. The company was liquidated in 1895. Also see the book â€œTypewriterâ€� page 110.